This is the longest unintended hiatus I have ever taken from this blog. As with all such absences, it usually takes something of great moment to jar me out of my inertia and get posting again. For the last few days, that something looked like it was going to be my rage and despair over Bill C-51 and the Prime Minister’s utterly cynical use of fear for political ends. I have a post partially drafted on that. 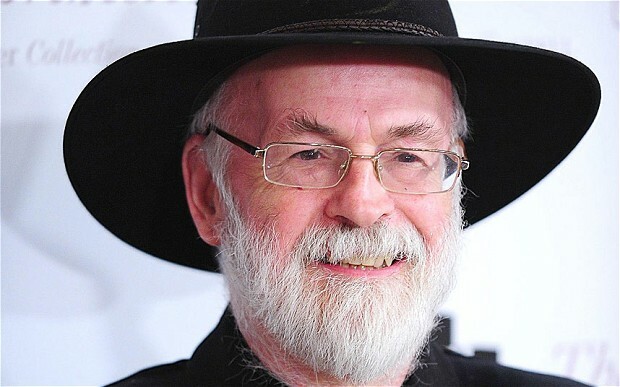 Three hours ago I logged into Facebook and discovered, by way of about half a dozen posts, that Sir Terry Pratchett died today at the age of 66. I am beyond devastated: after reading all but four of his forty Discworld novels, it feels as though I have lost a close friend. Not that the news comes as a shock. Anyone familiar with Sir Terry knows he was diagnosed with Alzheimer’s Disease in 2007, and has since that day been a brave and passionate advocate for dying with dignity … to say nothing of still managing to author six more Discworld novels. He has spoken very candidly about his disease with typical wit and humour (referring to Alzheimer’s as the “embuggerance”). So we’ve know this day was coming. But that doesn’t make it any less shattering. I think I feel this loss particularly keenly because I have been looking at Sir Terry’s work from a more academic perspective for the last year or two as part of my broader research into contemporary fantasy and its humanist turn. Bringing a more critical and analytical eye to bear on the Discworld has made me appreciate even more the deeply intellectual, philosophical, and literary qualities of his writing—qualities that are at first glance easy to miss because of the brilliant humour animating his narratives, to say nothing of how mind-numbingly prolific he is. Was. How prolific he was. It is a wrench just having to talk about him in the past tense. 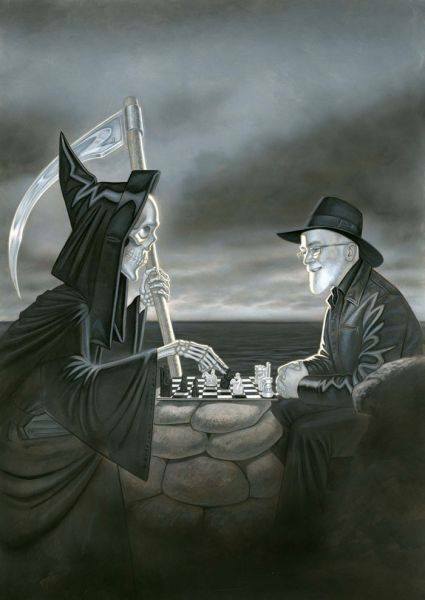 Pratchett was a writer who deserves a far more “literary” reputation than he had. He worked uphill against a quadruple whammy: (1) he wrote fantasy, which still tends not to be appreciated by literary types; (2) he wrote comic novels, which again tends to render an author unserious in many people’s minds; (3) he was massively prolific, which also gives rise to the assumption that individual novels aren’t likely to be anything special unless they’re labored over for Franzen-length composition periods; (4) and of course, he was hugely popular. I’m not saying that all his novels were gems, but at his best—in Small Gods, Witches Abroad, Night Watch, Hogfather, or Thud!, to name a few—he wrote perfect narratives with richly textured characters that offered trenchant critiques of just about everything imaginable, from the genre of fantasy itself, to racism and high-minded prejudices, to the many lies society tells itself to salve over bad conscience or its own contradictions. What I love so dearly about the Discworld novels is precisely this rage proceeding from love, rage and love rooted in a passionate humanism. Not the kind of humanism that seeks to define or put limits on humanity, but a humanism that starts with the knowledge that humans are fallible, venal, silly creatures with the capacity for great good or great evil, and finds beauty and nobility in the sheer messiness of it all. Or as the demon Crowley reflects in Good Omens, humans are capable of deeper depravity than the lowest of Hell’s denizens, and flights of grace that could overtop the highest of Heaven’s. The Discworld novels depict humanity as flawed but struggling to do right, and the villains are always those who abhor the caprice and messiness of the human condition and seek to perfect it at any cost: the fairy godmother Lily in Witches Abroad, who forces fairy-tale perfection on a city at the cost of its people’s freedom; the evil ideologue in Night Watch who seeks to perfect people according to his narrow definitions; the fundamentalist dwarfs in The Fifth Elephant, Thud! and Raising Steam, who are thinly veiled allegories of the Taliban; the shadowy cabal of aristocrats in The Truth who scheme to restore the ascendancy of the nobility; and perhaps most chilling of all, the entities known as the Auditors who periodically (Reaper Man, Thief of Time, Hogfather) appear and attempt to eliminate caprice and unpredictability from the universe. As Samuel Vimes reflects in Night Watch, “As soon as you saw people as things to be measured, they didn’t measure up.” And that, in Sir Terry’s world, is the greatest evil of all. There is so much more I could say about Sir Terry and the brilliance that is Discworld—and I will in the future—but for now I will close out saying that however sorrowful the news of his death is, we can take comfort that he faced it with his eyes open. And after forty Discworld novels, he’ll meet Death as an old friend. Remember, Sir Terry, he can never remember how the knight moves. I thank you for your moving tribute. I came across Pratchett late in my reading life but feel confident that his work will fill many of my weekends. I have felt so lucky to have found your blog this past year; I scheduled my week around it and will continue to do so. Thanks again, Karen. Thank you for that fine tribute to a truly great man.